It was three a.m. and I awoke to purring in the rafters above my bed. If I would have woken up hungry for a snack, it would have been ok, and I would pilfered some cookies and gone back to bed. If it had been a housemate sleep-talking, no big deal. If it had been coyotes howling at the harvest moon, I would have enjoyed it a bit, and soon dozed off. But no. This was purring. Loud, unceasing, un-cat-produced purring that had disturbed my sleep the entire month. Slinging my slug-like body over the wrong side of bed, I punched that ceiling as hard as I could. My fist slammed through the drywall and out again in a shower of crumbles. Before my sleep-numbed mind could fully comprehend the significance of that fact…. small creatures began pouring out of the now-gaping, fist sized hole. I careened out of the room as fast as my fogged brain would allow, and cautiously peeped through the crack of the door. Yes. Bees were filling my room, pouring out of the hole in the ceiling in a slow but steady stream. I closed the door, and stared weakly at myself in the bathroom mirror for a good while. A plan began to formulate in my mind. 10 minutes later, I climbed the stairs in full-on combat gear. Orange down winter jacket, water-proof hunting boots, gloves, insulated dungarees…. I had it all. Think, obese pumpkin merged with Si Robertson, and you’ll have a general picture. All I needed yet was a patch for the hole in the ceiling, and I would be ready to save the day. No matter how you tear it, silently creating a duct-tape patch in the still of night was impossible to do. My sister’s door opened and she blinked at me with groggy amazement. “Don’t be alarmed! It’s just me.” I wasn’t sure what her reaction would be to a gloved, dungaree-wearing form in the semi-darkness. “It’s bees.” I said, and explained. She, dear lamb, believed my dubious declaration that the situation was under control, and retreated. Patch made, I shrouded my head inside a thin pillowcase, pulled my hood up, laid the patch across my open palm, and crept inside the infested room as quietly as heavy hunting boots would allow. The pillowcase was light blue and limited my vision quite considerably. By the dim light of a small lamp, I could see that bees were continuing to swarm out of the hole in the ceiling. Their inquisitive buzzing throughout the room alarmed me. I shifted the pillowcase, but that did nothing to improve my vision. Were bees…. landing on me? Were they slowly crawling towards my NECK? 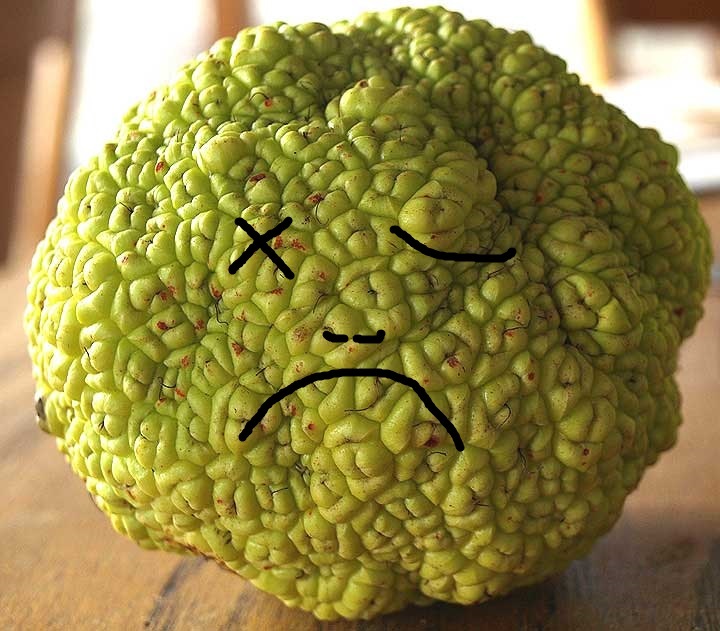 Would I be stung until my face looked like an Osage orange, and I was forced to spend my entire (tiny) savings on steroid shots? My face was turning bright red within the stifling layers of my protective gear. “Fight or flight?” I asked myself, and being as it was 3:30 a.m., and I had made it only half way across the room, and was even more overheated, and Osage-orange-looking-people are rather obtrusively unattractive (although I’ve never seen one, and was just going by intuition), and I really hate doctor bills… flight seemed much more logical. So, 4:00 found a non-triumphant, non-osage-orange, non-obese-pumpkin girl curled up on the couch, asleep. Victory could wait until daylight, and it did.